The Park Scholarships Class of 2015 donated a “solar tree” to the University. The “solar tree” is a charging station for “laptops, phones and other devices.” This one of those feel good acts that does nothing. In this case, it does less than nothing. Let’s get a perspective on the scope of the problem the solar tree is addressing. (I almost wrote “solving” but that would be inaccurate.) The benefit of the solar tree is that “laptops, phones and other devices” will be charged on this free, clean energy. According to EPRI, the cost to charge an iPad for whole year is $1.36. It is only $0.25 for an iPhone and $8.31 for a laptop. 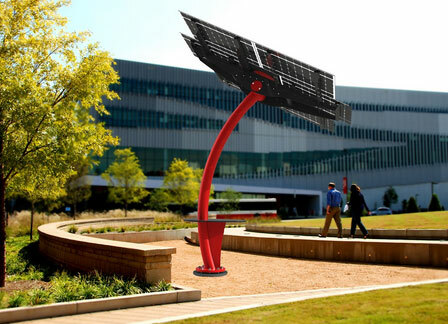 The “free” energy provided by the solar tree comes with an upfront cost of $40,000. So the break-even point is somewhere between 4,800 laptop-years and 160,000 iPhone-years. It is unlikely to provide a positive ROI as charging station. Moreover, there is no demand for more charging stations on campus. The location is preposterous. It is outside, off the beaten path between two non-academic buildings, and does not have a seat. On the dozens of times I’ve passed the tree, I have never seen anyone using it. Which is understandable because we have charging stations all over campus in far more convenient places. I posted a picture of one of them to the right. The charging-station idea is not the problem…well, yes it is. But the solar tree fails basic economics. It has a 1,500 Watt solar panel. Raleigh’s sun rate is 58%. The annual hours of sun is 2542 (365.25 days/year x 12 hours of sun per day x 0.58). Assuming no losses and all generated energy is used, annual energy output is 3813 kWh. Average residential rate for Raleigh (at the time of this writing) is less than $0.11 per kWh. The commercial rate (closer to what NCSU pays) is $0.085. So the solar tree can generate approximately $420 of electricity ($324 commercial) annually. Unfortunately, this project is not unique. Solar energy is just not cost-effective today. Moreover, there are inherent problems with unreliable solar and wind power. Moreover, this “sustainable” project is not sustainable because there certainly is far more energy used to produce and fabricate, transport, install, and, ultimately, depose of it then will ever be supplied by it. It is a net-negative on the environment. A renewable energy source that is not affordable is not a renewable energy source. There are many situations in which solar panels are excellent but this is not one of them. Unfortunately, renewable energy has been politicized to the point where any attempt is considered good. But most are not good. Much tax payer money has been wasted on feel-good projects. Moreover, it exploits the good will of our citizens, which is finite. This project is tragically silly. It should embarrass the Park Scholars of 2015. Not because their heart isn’t in the right place. But because wishful thinking should not trump common sense. In the article quoted above it was said “we are proud that this project becomes part of the story of how Park Scholars give back.” If that is all there is to the story the University is wasting their money. The press release claims the solar tree “is elevating renewable energy to new heights.” Maybe some of those involved in this project are high but the project is an embarrassing low for the university–the premier engineering college in the state. Related: Bjorn Lomborg has a good video on benefits of electrics cars.